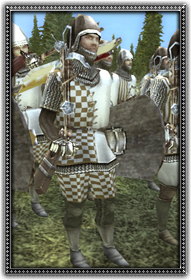 The crossbow is an excellent weapon for the militiaman, being easy to use, although slow to reload. These men carry a large pavise shield to give them some protection while reloading. Being relatively wealthy townsfolk, they can also afford decent armour. A certain number of militia can be maintained in a city for free.